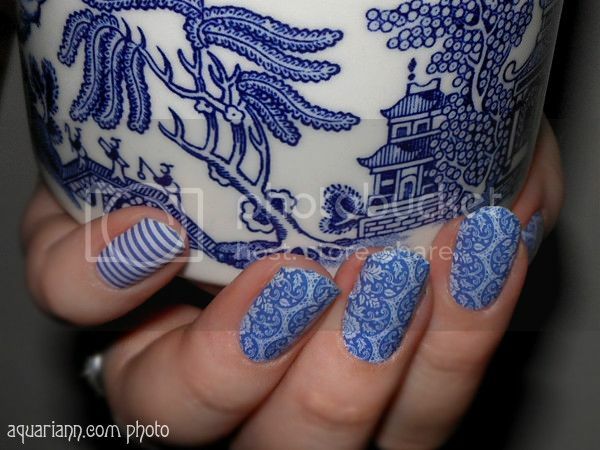 I'm glad I didn't shatter my mom's Blue Willow china with my shriek of excitement when I found out I won my first Jamberry giveaway, thanks to Sarah White. (I've entered dozens since March - I even have a Google keyword alert set up, so bookmark my Giveaway Chest Linky if you want to enter to win nail art prizes, too.) Sarah is an independent consultant because selling Jamberry Nails products allows her to stay at home to take care of her four young children and still earn cash for her family in a fun way. She sent me a free code to pick out any sheet of nail wraps. I already had a long wish list and Porcelain wasn't on it. 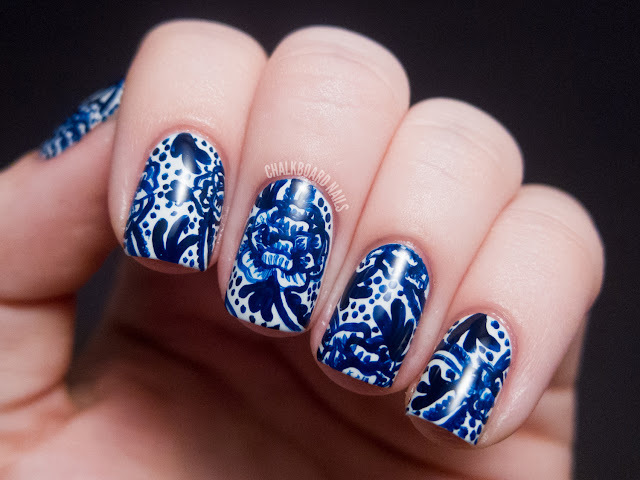 But while browsing Jamberry's 300+ options, the beautiful blue and white rose nail art refused to be a wallflower in their Garden Party collection. The delightful design mingled in my vision until I finally decided to order it. I'm glad I did - it's even prettier in person, especially paired with the Navy Skinny accent on my pinky fingernail. Congratulations on your win. 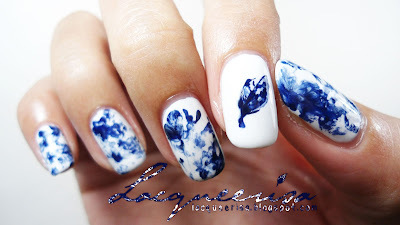 The porcelain blue nail wraps look amazing. Awesome! Love the nail wraps you chose. They look wonderful. Congrats! Gorgeous design! Absolutely love it! I love both the stripes and the porcelain look - fabulous mix! I was anxiously awaiting your Manicure Monday post to see what new and exciting design you would be wearing! They are lovely and you have the perfect nails to showcase these lovely wraps! Love them, especially together!! Such a great photo too! These are beautiful. I've never tried nail wraps before. Do your nails have to be a certain length? Are they complicated? I was introduced to nail wraps back in February and was amazed at how easy they were to apply, just watch the official application video first! It does take longer than painting your nails - but the extra half an hour is worth them lasting at least a week more without chipping. I've seen them on short nails, and have even applied them to my tiniest toe nail, so I don't think the length matters.